Steve Reed, Labour MP for Croydon North, has warned that leaving the European Union would see Croydon lose jobs and investment. 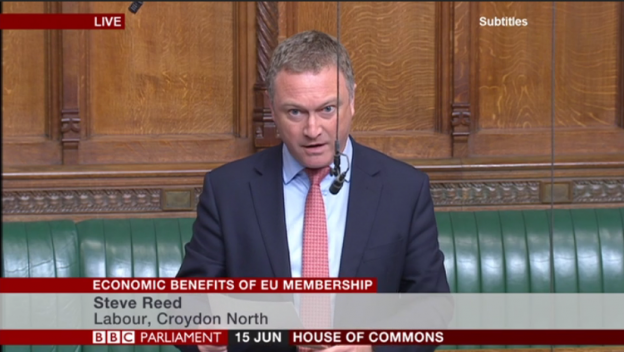 Speaking in Parliament on Wednesday 15 June, Steve Reed said that the risk of a Leave vote meant that Croydon’s bright future has a big question mark hanging over it. But the Croydon North MP said that he was ‘confident that voters in Croydon North will vote next week to remain part of the European Union’. People in Croydon benefit from the EU’s employment protection, as well as the jobs and investment from London’s role as Europe’s leading financial centre. Investors would think again about backing Croydon if it was outside the EU. Steve has been campaigning for a Remain vote across the borough, including launching the Croydon Labour In campaign at the start of June. You can read Steve’s speech in full here or watch it below.